Choice of equipment: I had already chosen NASA instrumentation for the wind displays so it seemed obvious to stay with that maker. However I opted for the less expensive “Target” range for the Compass and for the Speed Log rather than the “Clipper” range. I also bought a GPS repeater, that is only available in the NASA “Clipper” range. 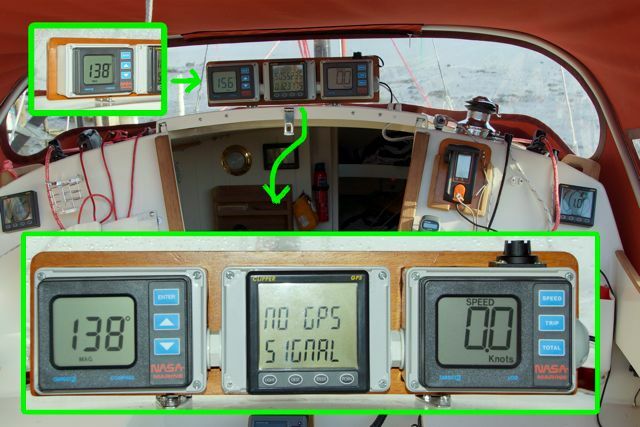 Installation: I wanted the instruments to be visible from both sides of the cockpit but I thought that placing them below the companionway was too low. The alternative seemed to be to mount them on the hatch, however the NASA instrument dials need to have a dry enclosure behind them. Commercially available consoles seemed to be aimed at larger yachts and were expensive and unnecessarily large. I therefore built my own using environmental boxes inset into a marine ply backing panel and connected using standard plastic “tank connectors” from a plumbing store. The result seemed clumsy before I fitted it (I couldn’t source shallower boxes). However once installed it seems OK, and the spray hood tucks down behind it very neatly. Swallow Boats installed the paddle wheel for the log in the starboard cockpit drain area (aft of the self-bailer) because it should be safe from damage when Seatern is on the trailer. I installed the fluxgate compass unit in the forward buoyancy compartment with the lead being taken through a waterproof gland to preserve the compartment integrity. Compass: Choosing a site for the flux-gate sensor free from magnetic influences was a problem and the present site was chosen before I installed the Cool-Box. NASA have changed the way you calibrate this instrument. Rather than motor at a fixed slow speed in a circle (which is almost impossible in a river with currents) you now have to motor on fixed headings at 45 degree intervals. My one attempt was not successful and I think I need to do it with someone else in the boat to help. Even if not entirely accurate it gives a useful reference and I have a Plastimo sighting compass or the compass in my binoculars (and also the compass app in the iPhone) if I want a correct bearing. 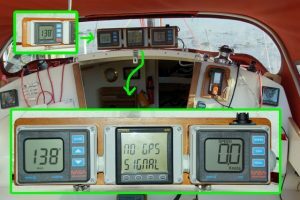 GPS Repeater: The aim of this is to provide a clearer steering aid, when sailing or motoring towards a way point, compared to trying to monitor your track on a Chart Plotter. I do use it for that and it has the advantage over using a compass bearing in that it is updated as your position relative to the waypoint changes. Note added 2017: I never really liked the Close Haul repeater and it has now been removed. The hatch-top instruments consist of the Compass (left) and the GPS repeater (right). There is now a gap between which allows the lowered mast to be supported by the boom gallows which was the original design intention.